My acupuncturist is out of town. Last week, I visited a new one. Her office was full of natural health magazines, and I started perusing them. One magazine had a life-coaching column. A guy - let's call him Oscar - wrote about his job. Oscar was in his last year of a job before retirement, and his boss asked him to switch departments. Since he wanted to please his boss, he did. It turned out that his new job was agonizing, and was making his very last year on the job a miserable one. So the life-coach started analyzing: What could Oscar have done differently to begin with? He could have asked to try the job for a couple of weeks. He could have asked to speak to some other people in that department to "feel things out." He could have been more assertive with his boss. Yet it wasn't only that Oscar wanted to please his boss, they discovered. Oscar was afraid of conflict. Oscar and the life-coach wanted to figure out how this fear of conflict affected other areas of his life. Oscar realized this was the reason he was still involved in a relationship. He liked this girl very much, but didn't see a future with her. He stayed in the relationship because he was afraid to hurt her, afraid of the conflict that would ensue. The sessions with the life coach gave him the courage to end things. It also cleared up other areas of his life, and helped him end this negative pattern. I started thinking; I'm a lot like Oscar. There's many choices I've made in my life because I was afraid of conflict - my Hebrew school job is a prime example. When I spoke to my mashpia about taking the job, she wisely advised me to try it for a month. She told me to stipulate this to the Hebrew school director, that I was trying it on a trial basis. When the month came and went, I saw it was too draining on myself and my family. Yet I didn't quit. I blamed it on my tenacity, but this article helped me see the truth. I have stayed in other situations for far too long, being afraid to stand up and make positive change. My fear of conflict has adversely affected friendships, as well. I have emotionally constipated myself in order to maintain peace, but that's not true peace. And that's not what real friendship is about, either. It took a certain friend to "call me out" on something she didn't like, to give me the courage to move forward and explore this issue. Anyway, we have this stupid school scholarship dinner coming up. I have to submit an ad to the dinner journal. I typed it up, and made sure to give it to one of the women in charge of journal ads. So last night she said to me, "Maven, are you writing up something for the journal?" And I said, "I gave it to you already, remember?" "Oh yes, that's right." This morning I had to call her about another issue, and the journal ad came up again. She thought perhaps she gave it to the other woman in charge of the journal ads. Would I mind emailing the other woman about it? I almost told her I would send the email. But somehow, I mustered up the courage to say "No." Now, I didn't say, "This is your drama and you need to resolve it." This particular woman is in a position of authority, and it would be disrespectful of me to tell her to fix it herself. So I just said, "I'm sorry, I won't be near the computer today. If you could email her yourself, that would be helpful." I know I didn't exactly tell the truth. But I didn't put myself in a situation that I would have resented, either. It feels like a small victory. Rivky got a 20.00 Target gift card for her birthday. Since I didn't have to teach this morning, I figured we could take the kids there and run some other errands. Around and around we went through the toy aisles. Rivky kept asking, "If I buy this, how much money will I have left?" I was totally empathic. I could feel like a 6 year old in a toy store, with so many choices. After half an hour of deep contemplation, she finally decided. Then Chaya piped up and said, "I left my money at home, can you buy me this Polly Pocket and I'll pay you back?" I was ready to say yes, but Yaakov beat me to the punch. "No, you have enough Polly Pockets." Since Yaakov said no, I wasn't about to disagree with him in front of the kids. Thus began the Target Soap Opera. Chaya started to cry faster than you could say "Drama Queen." She really went to town. I said, "You can hold the Polly Pocket while we finish shopping," but she would not stop carrying on. We passed the furniture section and there were these 2 big chairs. So I said, "Chaya, have a seat and get it all out. When you're done, we'll move on." She cried, rationalized, begged and pleaded. I sat in the other chair and sympathized with her. When she was done we started walking, but then she started crying all over again. Back to the chairs! This happened one more time before she was through. Then we went to the little CD listening station and sampled "relaxing" CD's. That's when Yaakov and the boys caught up with us. She started welling up at the cash register again. She placed her Polly Pocket underneath the Chapsticks and Tic-Tacs, leaving her alone on her funeral pyre. I felt Chaya needed to mourn, so I didn't bother to calm her. The rest of the day was more of the same, different kids with different meltdowns. I finally lost my temper at the end of the day, and I almost called a friend for a cigarette. The other day Yaakov started doing this funky dance around the kitchen. "I got the Obama groove," he informed me. We giggled. Both of us were enamored with Republican Ron Paul, so I know full well that Yaakov isn't down with Barack Obama. But what is it about that guy? I've been thinking about this "Obama Magic" that pundits have been palavering over. He is just magnetic. I mean, first of all, he's a handsome guy. And those teeth! Those beautiful white teeth against that smiling black face! And speaking of blackness, it's a major factor. He's black enough for black folks, but not "too black" (Jessie Jackson, Al Sharpton) to scare away us honkies. He appeals to a broad spectrum of people, and has tailored his campaign to do so. And another point, his race makes him different. People want different now. He's intelligent and well-educated. He's a great orator and he inspires. When he's not debating issues, he's giving these "Up With People" victory speeches. He makes you feel good: good about the country, good about yourself. He makes you want to change things for the better. That's his mantra - CHANGE. He's certainly made enough positive changes in his own community. People like to caricature his Muslim background. They send out emails that he was sworn into office on a Koran or he wouldn't pledge allegiance. People want to turn him into a closet Islamo-facist. I think it's hogwash. His political track record is strongly pro-Israel, something I doubt many terrorists can claim. Besides, am I the only one who considers his Muslim background favorable when it comes to foreign diplomacy? Even though he is thoroughly LESS experienced than Hillary, he makes his Washington newbie status a plus. He's not the "same old, same old" Washington bureaucrat. He's also chivalrous! Did you see how he pulled out Hillary's chair after their date debate at the Kodak? Even though they're more or less politically aligned, there's something fresh and beautiful about Barack Obama. It's a charm, a sense of humor...something. I can't say I'm politically on the same page as Senator Obama, but I'd savor an Obama victory far more than a Clinton or McCain one. What can I say? He's special. Last night while bathing 8 year old Chaya, she asked, "Why are boys' bodies and girls' bodies different?" I answered stupidly, "I don't know, why do you think?" (I thought maybe she heard something in school.) "I don't know," she shrugged. "Maybe it's because boys and girls grow up and do different things," I suggested. "Yeah," she said. "Like girls grow up to be movie stars and boys grow up to be fix-it men." 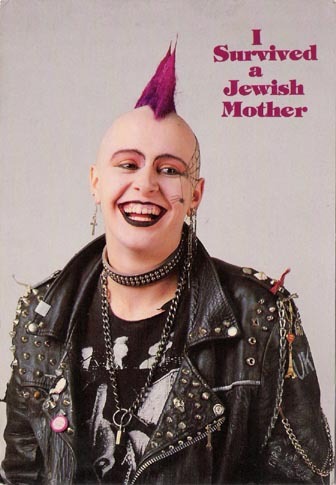 "Or maybe," I said, "It's because boys grow up to be rabbis and girls grow up to be mommies?" "Or rebbetzins," she smartly rejoined. That closed the conversation - for now. But I know there will be a time when it's opened again, and this simple answer will not be enough. I belong to a message board for frum women, and this topic comes up from time to time. I'm surprised by the things I learn from the women who post. Many women write that when they were (religious) teens, they heard all about this from their peers in school. Some ladies from uber-chassidish homes say they only learned about it before they got married (and a few were extremely disturbed and upset). Some ladies wrote that their mothers gently told them, when they asked. I think I'm going to end up being one of those latter mothers. Chaya is too smart and too curious, and I know the day will come when the truth must be told. I just hope it doesn't happen anytime soon.